Hide-a-Lite 4 LED tape lighting is state-of-the-art technology for the 21st century. Perfect for the environmentally conscious customer, these super-efficient and long lasting lights (TM-21 rated life of 40,000 hours) provide energy savings up to 90% compared to traditional light sources. These discrete strips (only 1/8 in. thick) use only 3 watts per foot and emit 120 lumens per foot at 85 CRI to improve visibility and brightness on countertops. To begin, select a tape length or lengths and a transformer; then, select additional system components as necessary to easily customize for your installation requirements. Wireless LED Touch Control Warm White 12" (30.5cm) Under Cabinet Utility Light, Use a lightly Touch to activate On / Off Operation. Ideal for Bedroom, Closet, Kitchen , Office, Bathroom, Camping, traveling and Workshops. Anywhere you need light at a Touch. Mounting Hardware and Template included. Batteries (not included) 4 AA. The Commercial Electric 9-inch LED Direct Wire Under Cabinet Light furnishes uniform, flicker-free illumination perfect for task or accent lighting. Designed for under-cabinet placement and other dimly lit areas of the home, the 120V hardwired fixture provides brilliant white light for kitchen countertops and other household work surfaces. The curved, frosted lens provides even light distribution without any hot spots or shadows, offering wide-spectrum coverage to boost visibility and productivity. 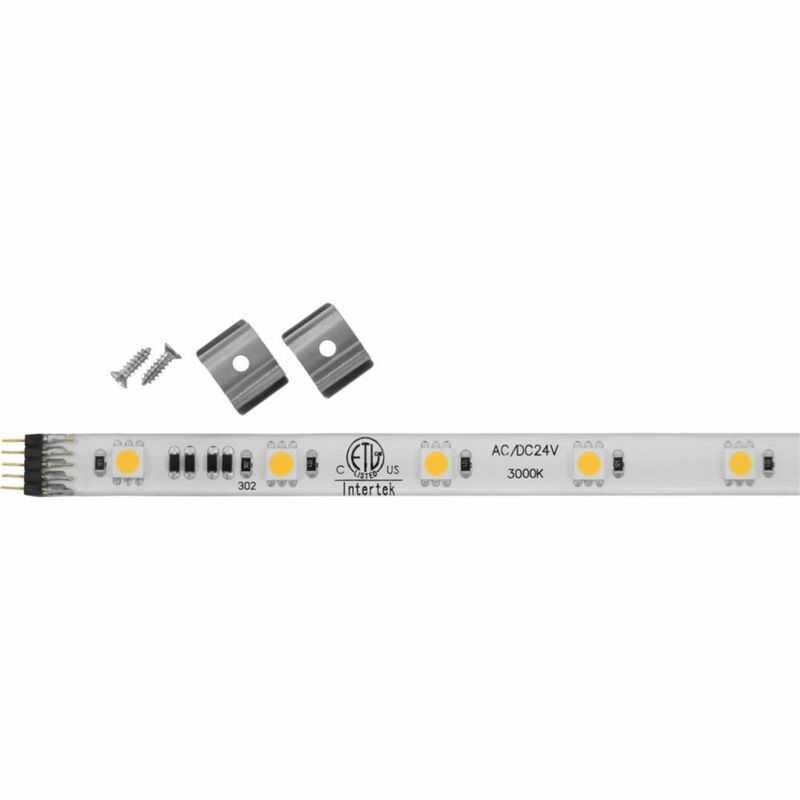 The 3000K colour temperature is similar to halogen lamps, but this LED unit lasts up to 50,000 hours and does not require bulb changes, making it maintenance-free. It consumes less energy than fluorescent or incandescent under-cabinet fixtures and the aluminum housing stays cool to the touch for safe use. Full-range dimming is achieved with a separately sold dimmer. Offer different size in 12 in., 18 in., 24 in., and 36-inch with both white and bronze finish for choice. Hide-A-Lite 4 Led 12 In. 3000k Tape Light Hide-a-Lite 4 LED tape lighting is state-of-the-art technology for the 21st century. Perfect for the environmentally conscious customer, these super-efficient and long lasting lights (TM-21 rated life of 40,000 hours) provide energy savings up to 90% compared to traditional light sources. These discrete strips (only 1/8 in. thick) use only 3 watts per foot and emit 120 lumens per foot at 85 CRI to improve visibility and brightness on countertops. To begin, select a tape length or lengths and a transformer; then, select additional system components as necessary to easily customize for your installation requirements. Hide-A-Lite 4 Led 12 In. 3000k Tape Light is rated 1.0 out of 5 by 1.